I love your blog and I would love to win your giveaway. Thanks!! can't wait to check out your shop today! He ran and ran all the way to my house! Love the Gingerbread Man tassle. Super cute! I love the gingerbread man! I will definitely be checking your shop today for frames. Wow....I am so impressed. I love the sight. It is my first visit. I saw your link on MoneySavingMom.com and wanted to check it out. You have got a great thing going on. I TOO would love to be entered in your contest. I absolutely love the gingerbread. My fingers are crossed twice in hopes of winning!!! These are so adorable!! Would be an honor to have your beautiful creations in my home!! Oh how CUTE!!! I would love to win! Thanks so much!!! OH MY GOODNESS!!!! Please, please, pick me....!!!! I put your giveaway on my sidebar!!! Love gingerbread cuteness!!! Can't wait to see the houses you do, and then yours! Keep us posted! I'm a follower of your blog and really enjoy all the things you do and it inspires me to TRY some on my own. Oh please can I win. I love your beautiful decorations and especially gingerbread men. I just love your blog. I am a follower and have looked forward to seeing everything you make. And post for that matter. Love the gingerbread man tassle. I have been following your blog for over a year and look forward each week to what you have posted. Love this giveaway! Ooh! I love these Gingerbread babies!! I'll be posting about this on my blog too! Thank you so much for the chance to win! I love all your creations and these items will go so well with the gingerbread house I bought from you last month! Oh Kristen how cute! I just love everything you have chosen to giveaway. Precious! Thank you for the chance to win. I am about to post something new and I will mention your giveaway for a second chance. I am a happily a loyal friend and follower. Happy Sunday and future gift shopping! Can you believe I finished already? I can't. I forgot! I would like to add the *Joy to the World* tassel to my two frames I am buying. Can you make the tassel frame and the red cross frame both *M*'s. I know I have several already but I just love em'. Let me know when you can mail them. If you want to show me first with photos email when you can. I'm wondering what color frame for the tassled one and ribbon colors too. Hmmmmm? Come to think of it will the frames look to large for *M*'s int he center? Let me know what you think. I want them either way. I put your giveaway on my sidebar, Kristen (with a link back here). I love reading your blog regularly even though I am not a blogger. I collect gingerbread ornaments for my own tree so I would love anything gingerbread. Kristen, I check out your blog EVERY day to see if you have posted anything new. You always inspire me with your talents. Keep up the good work! LUV the gingerbread theme...just last week I was looking at your 2009 Christmas Decor,again! What a fabulous giveaway! I love all things gingerbread! Kristen, what a great giveaway. I love all of it. So cute. Glad your thanksgiving was good. OH WOW,I LOVE the gingerbread theme,so great! I would love to win these for my house! Please count me in! I am a new follower.Come follow me back if you will,I love having new visiters! oh goodness I have never entered any type of giveaway, but these little gingerbreads are adorable! i love them. your decorations and crafts are stunning! p.s. if i can figure out how to add you to a blog, i am sure going to try. i just really hope i can win on this giveaway. ha. fingers crossed! How adorable!! It's times like this I really wish I were a lucky person! lol!! Thanks, Kristen, for such a fantastic giveaway!! I love these they would go great with my gingerbread tree int he kitchen! Hi! I just found your blog today while blog surfing and I've signed on to follow. I love all your beautiful frames! Please enter me in your wonderful giveaway. Thanks and have a great day! Hi Kristen, I have been a loyal follower of yours since I saw your first posting on Rate My Space. I would love to win your giveaway! It sure is a bad time of year for dieting! I would love to win these cute gingerbread men. Every year my children and I look for a new gingerbread decoration to add to our collection. My kiddos would love it! Love them all they are so cute. I love your blog and your beautiful creations. I am keeping my fingers crossed that I win! Oh I love this:) Thanks for the giveaway. 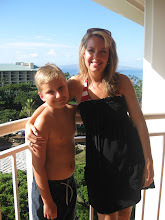 Hi Kristen, I found your blog through Melissa Miller and am now a follower. Please count me in for your giveaway. Thanks! This is my first time to enter a Giveaway. I found your blog through Rate My Space on HGTV.com and just love it. I love your blog and your talent!! I am currently doing my new kitchen in Gingerbread men/women, I hope I win. I'm new to blog land. How do I get a nickname? I entered by gmail address and password, but I didn't see anywhere to chose a nickname. The last message that says "Nickname Unavailable" is me! Here from Melissa's Heart and Home.... SOO glad I found you. I've have been reading your blog for a while! You are very talented! I would love to win your precious give away! Looking forward to seeing all the houses you make beautiful for the holidays! I've been a follower for a year now. The gingerbread is so cute! If I don't win, maybe I'll have to buy him. I love, loVE, LOVE gingerbread men...and your blog. I'm crossing my fingers that I am your winner!!! Hi Kristen - I absolutely ADORE your work, your house, EVERYTHING! Do you know it was your ratemyspace Christmas pix that introduced me to the wonderful world of blogs? I think I've put on 10 lbs. since then because I haven't been able to ignore my laptop since - you are always my first stop :) You are amazingly talented and you have inspired me to try to be a little more creative and a little less afraid to fail! Best wishes to you and your family this holiday season! I am a new follower to your blog. I so so would like to win the giveaways. Love your blog !!! Great giveaway! I hope I win! You are so talented!! I tried to make a tree topper like you have photos of and mine didn't turn out right...so it came down! lol! Love all your stuff!! You know how I would love to win all this wonderful gingerbread themed "stuff". So, I am leaving a comment, am already a follower, and am posting on my blog sidebar tonight. You are such an inspiration with all your lovely decorating tips and ideas. Your home is always lovely and your designs always beautiful. Thank you for the time you take to bless the rest of us who follow your blog. I just found your blog and love all of your decorating ideas. My e-mail is heatherrfranks@gmail.com. Hi Kristen! Happpy Holiday to you and your family. I love reading your blog and look forward to seeing the new items you post in your etsy store. I have purchased items from you for myself and for gifts. I love your ginerbread give away and-- is it selfish to say I hope I win!! Oh what a darling giveaway! I'd love to win this one:) I have a soup giveaway on my blog (I know how strange that sounds)make sure you sign up! Oh how cute. Gingerbread stuff would go perfect in my house. love your blog! thanks for the giveaway!! win that tassel,don't have a blog but I'm leaving my e-mail. What an adorable giveaway! Everything in my kitchen this holiday is in the bright red and green color scheme. Your items would look sooo cute in there. Melissa sent me and I'm sooo glad she did! I love gingerbread people! Thank you for such a fun giveaway! I LOVE your blog. I found you through RMS a long time ago. I love your giveaway. On my way to check out your shop. I am a new fan of yours. I love your decorating and all of the lovely frames and arrangements you make. 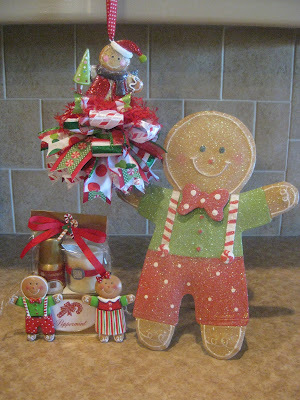 I'm excited about the gingerbread giveaway - soooo cute! I'd love to win as I have a large gingerbread collection plus a entire set of hand painted gingerbread dishes! Wow! I'm so hoping I'm picked for this adorable give away. You are so very generous and these would look so cute in my kitchen! I really hope I win! Thank you so much! Your kindness is truly appreciated. Oh, my gingerbread kitchen would love this prize! Lovely blog--I'm becoming a follower. Thanks for being such an inspiration. Your blog is a pleasure to read. What a fabulous giveaway! Please count me in! I'd be thrilled to win! I just love your blog! I check it everyday just to look at your beautiful decor! Ooooh! My mom collects all things gingerbread and she would love, love love these! I just posted your giveaway on my blog too! Thank you for the chance to win! A friend showed me your blog...Love it!! I'll be checking in daily! Love the gingerbread giveaway...nice to see someone sharing with the consumers. I love your designs!! And an adorable giveaway!! My email is: tlhgillikin@hotmail.com . Thank you! Love your blog and your decorating taste! I would love to win the gingerbread man package. Melissa from Kaufman's Cottage sent me. Wow! Thanks for the fun giveaway! Just found your blog this morning and have become a follower. I would love to win your giveaway. I love Gingers! PLEASE please please pick me !!! !I absolutley love gingerbread. I not only decorate everything at Christmas time with gingerbread but my kitchen is also decorated year round with gingerbread. I forgot to mention, please pick me for the giveaway:)I love it!! I'd love the chance to win! Could it get any cuter than the Gingerbread Man?! Too cute! Wonderful giveaway! Thanks for a chance to win some of your beautiful things. I've been folowing your blog for about a year now. you do some wonderful work, You rpictures really inspire me when decorating my home. I love the gingerbread men they're adorable. What an adorable giveaway! Thank you for the opportunity to enter. I would love to give the adorable gingerbread men a new home. I promise to love them lots and not bite their heads off (a little cookie humor). These giveaway items are so cute. I am thankful this season for all the things most of us are thankful for, but for this new to me blog as well! I was looking for examples of mesh ribbon wreaths a couple of months ago, and googled it to come up with your wonderful blog. My daughter, myself, Patti (my co-worker) and I gave this blog out tonight to my sister and her family. Blessings and thank you. What adorable items for a giveway! I love your blog and I check it out daily. Would love to win the giveaway!!!! Oh, I really really want this! PLEASe pick me!! Kristen, It was so nice to meet you at the NWA Boutique Show. You had so many beautiful things to buy. It was hard to choose from all the choices. It was nice to be reacquainted with your mom. I do follow you on your blog and have shared it with my daughter. Would love to win anything of yours! New reader! LOVE your blog and would LOVE to win! Thanks for the giveaway! What a cute tassel! Sigh!! Well as you know I do follow you. But as soon as I post your giveaway on my blog, I'll come back and let you know! Hugs! I love your blog. Thanks for offering such a lovely giveaway. Hi Kristen! I am back to let you know I mentioned your give away on my blog! Yay!! Have a great week! Hugs! What a wonderful giveaway! I am so glad you mentioned this one, I missed it earlier. Those items would fit into my decor perfectly this year! So cute! Add my name again please, I am going to post this on my blog as well! Thank you so much for the opportunity to win such cute gifts. I am a new reader to your blog and I love all you do! You inspire me. Thanks for the giveaway. I hope I win. I am a follower...I love your blog..and the house you just decorated..oh my..no words can describe how beautiful it is..you did an amazing job! The gingerbread guys are adorable! Soo cute! I'd love to win! I love everything you do. Sure wish I had some of your talent. Hope I win!! I love everything you do. Wish I had some of your talent. Hope I win!! So cute! Yes I am a follower. LOVE YOUR BLOG!! just started reading it and find it sooooo informative! You are very talented! p.s. would love to win! I left a comment, but failed to leave my email. Love the gingerbread pretties! I am a follower of your blog ... would love to win! I would love to adopt the lil guy if I'm chosen, so so so Cute!! I have posted your Giveaway on my blog tonight! Love all your designs. Thanks for sharing! 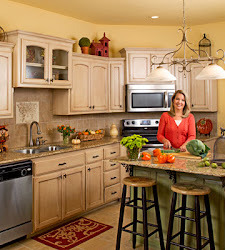 LOVE the home you decorated in your above post, too! It is beautiful. Thanks for sharing all the wonderful pictures! GINGERBREAD tassle... perfect for my kitchen decor with Mr. & Mrs. Santa, Gingerbread house & teapot, and little Gingerbread men..."running as fast as they can...." I am a follower too.. wouldn't miss your creative talents! Merry Christmas..
Hi Kristen....pls enter my name I would love to win. Hi, I love everything you do. 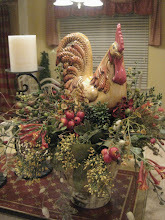 I found your blog from HGTV RMS a few years ago when you displayed a centerpiece with pepperming candy. I would love to win. Im putting up a gingerbread tree in my kitchen this year. Ooooh another gorgeous "Kristen Creation" that I want, I want, I want, lol. I'm in and thank you for doing the giveaway! How beautiful! A friend sent your blog to me and I am so glad she did. You are a very talented lady. I will be adding you to my list of blogs that I enjoy. My name is Carla and my email is hcparazine52@yahoo.com so when I win ;) you can send the cute gingerbread items on to me!!!!!!!!!!!! me me me! This is my first time to enter your drawing! I check your blog almost everyday to see whats new. I love your blog! I am new at being a follower and leaving a comment. I thought I left one earlier, but I don't think it worked. I have long admired your work and have purchased several items from your etsy store. I love every piece you have created. Your home is absolutely beautiful. Thank you for sharing your life with us that watch from afar. I would love to win your giveaway. The gingerbread family is sooooo cute! Thanks again for opening your heart to your followers! Whoever wins this is going to be one lucky person! Thank you! I would so love to win! Thanks for the opportunity ~ everything is just adorable. I'm a follower & subscriber too! I have followed your blog a long time and love seeing all the creative things you do! Would love to win one of your gorgeous items. I love your blog and check in frequently. I love all your bows on your frames especially. Run, Run, as fast as you can, you can't catch me, I'm the gingerbread man! I really enjoy your blog and love the gingerbread! Thanks for the chance to win. What a cute giveaway! I have done my dining room this year in gingerbread and peppermints and can't wait to post pics soon. I love to follow your blog and love the gingerbread items you have listed. They are sooo cute! Oh so cute! Even if I don't win, I'm so glad I stopped by. Love your decorating style! I love all things gingerbread, please enter my name in your drawing! Gorgeous stuff, love it! You are very talented! Too sweet Kristen. I love gingerbread at the Holidays. Thanks for offering the chance to win. Have a great weekend. What adorable gingerbread. Please enter me in your drawing. What cute Christmas items! I'd love to win them all! Thank you for the giveaway.